Dmitry Medvedev believes that in the future Russian presidents should belong to a political party, but that it can only happen when the majority of society can accept it. "I used to think that it is probably good that the president does not belong to any party. But I am not sure that this will always be so. Actually, on the contrary, I believe that sooner or later a president should be a party member,” Medvedev said on Friday at a meeting with young parliamentarians in the city of Kostroma in central Russia. The president underlined that it would happen only when the majority of the country's population could accept the idea. Otherwise, it may lead to “the vulnerability of the entire political structure”. On the whole, he observed, it is good when a leader of a state belongs to some party and there are very few examples when presidents “are free from one or another political force”. 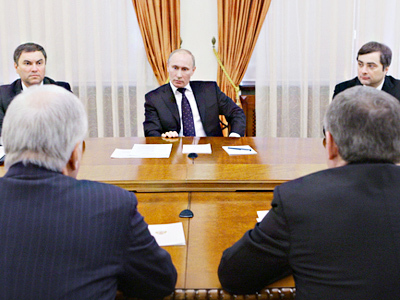 Medvedev's meeting with young members of the four parliamentary parties – the majority United Russia, Fair Russia, Liberal Democratic Party (LDPR) and the Communist Party – lasted for almost two hours. After the president's brief opening speech, the parties' members presented their proposals on what they would want to be improved in Russia's political system and also drew Medvedev's attention to hot social issues they believe should be addressed. That was followed by the president's comments on voiced suggestions and a series of questions from the politicians. Medvedev noted that his meetings with the factions' members, both in Moscow and in the regions, are crucially important for the country's political system, which is still at the beginning of its development path. Thanks to such informal gatherings, the quality of parliamentarianism has improved in the last several years and the level of its current development corresponds with the development of Russian society, Medvedev said. It is “neither worse nor better than our society and the level of its readiness”. “It does not mean that we have created a complete and well-working system. But we are adjusting it,” he pointed out. 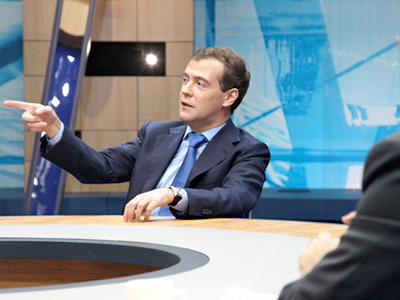 Medvedev said that he is often criticized for introducing changes to the political system too slowly or for making just “cosmetic” alterations. “Mainly those are people who are very far from political practice who say so. You do understand that you cannot shake the system as a pear tree as it might not stand it,” he observed. The president recalled that in the ‘90s after the Soviet Union ceased to exist, the country experienced a rapid change of the political regime which brought Russia to the verge of a civil war. And it was only thanks to the then leadership that the state avoided bloodshed. Medvedev agreed with the young deputies that too much power in the hands of one person could lead to negative consequences. "We should act strictly in accordance with the constitution, and any attempts to adjust the administration to suit a specific person are dangerous," he stressed. Referring to examples from history, the president observed that often such attempts lead either to civil wars or to stagnation. Commenting on Fair Russia deputy Grigory Fandeev’s complaints that Russian parliamentarians often have heir hands tied by the law and therefore are not given enough authority to fulfill their election promises, Medvedev promised to consider the proposed idea on adopting a law on parliamentary control and guarantees. 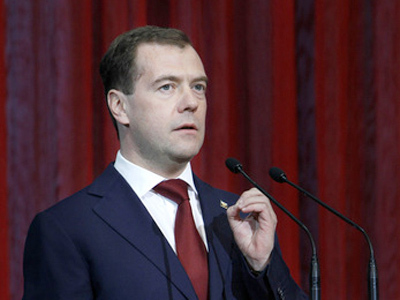 At the same time, Medvedev stressed that he sees no alternative to the presidential form of governance in Russia. “I am absolutely convinced that there is no alternative to the presidential form of governance due to the history, the size of our state and its very complex ethnic and religious structure," he said. However, that does not mean that the parliament should be suppressed. 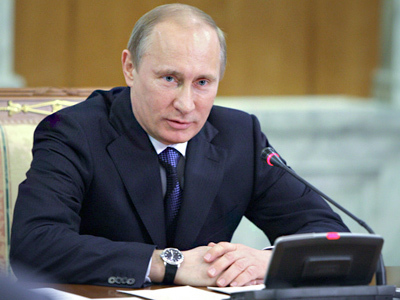 On the contrary, the president supports the development of legislative power in Russia. “The stronger it is, the better,” he added. 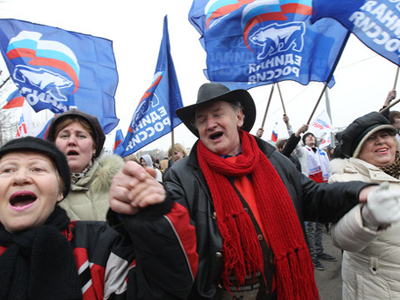 Russia is approaching a hot political season with the parliamentary election due in December this year and the presidential vote in 2012. The issue of election fairness was one of the topics discussed at Friday's meeting. 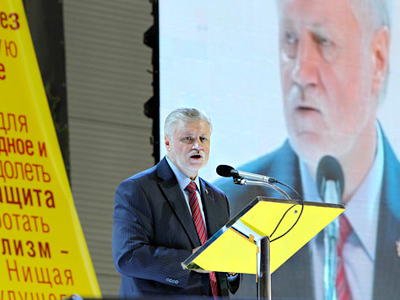 As a way of fighting election fraud, Yury Afonin from the Communist Party suggested making it possible for voters – who for one reason or another did not cast their ballots – to check if someone else used heir right to vote and put a signature in the registration book. Using transparent ballot boxes and modern technical equipment to count votes could also help tackle the problem. 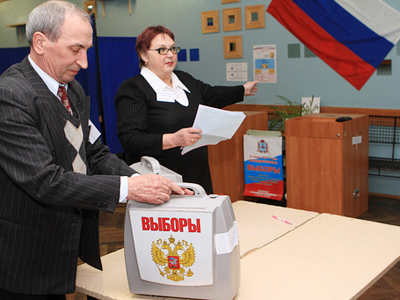 Commenting on the matter Medvedev noted that by 2015 about 90 per cent of Russian citizens will be able to use electronic vote counting devices which would speed up the process and make it a lot more transparent. One of the participants of the gathering asked Medvedev about the tough decisions that he had to make as president. The Russian leader said that one of the most difficult decisions he had to make was sending troops to South Ossetia in August 2008, when Georgia attacked the capital Tskhinval. Russia had to protect the citizens of the republic, many of whom had Russian passports. 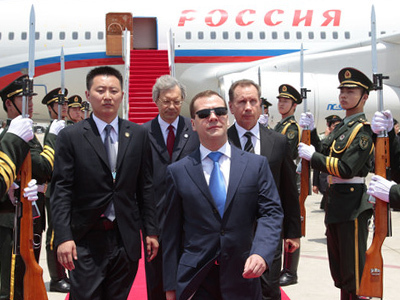 Recalling the events, Medvedev said that he realized that some troops would not return from that mission. He observed that being in a similar situation would be difficult for any leader of any country. “Those who have not made such a decision will never understand me,” he said. The president expressed hope that there would be as few decisions on the use of military force in the history of Russia. Yury Saprykin of United Russia suggested introducing a tougher punishment for reviving Nazi movements and rewriting history. The president, however, believes that there is no need to do so, but the laws should work more efficiently. Commenting on Nazi actions in former Soviet republics, the president said that they indicate the immaturity of political systems in those states. "As for Estonia, Georgia and Ukraine, it saddens me as much as you. It was unpleasant and painful to watch that," he said. However, he observed, It is not Russia's business to criticize them “but the business of voters to shape their own government". If the leadership “dances on the bones of people who once defended their country, we should realize what attitude we are going to hold to this government and choose our foreign policy priorities accordingly". Among other issues raised at the meeting were corruption, lack of political competition between parties, the junction of business and power, housing problems and education. 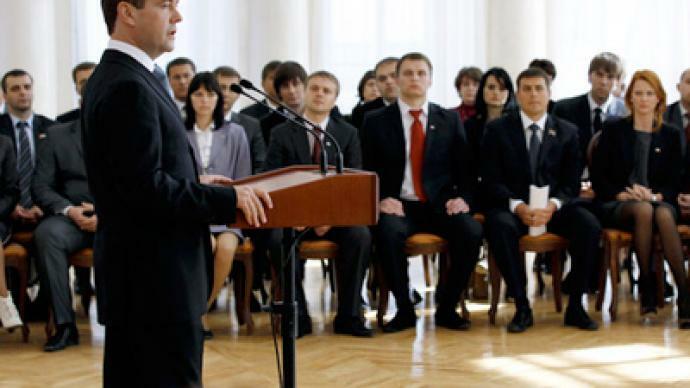 Medvedev pointed out that professional politicians rather than businessmen should work in regional parliaments and said that it is unacceptable when people get into politics only to use it as an instrument to increase their own welfare.